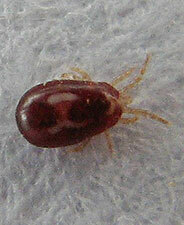 Red Mite are tiny almost flea size 'ecto parasites' that are attracted to Chicken Houses. They live in little nooks and crannies especially liking the ends of perches, and tucked away corners of the Chicken Coop. The hardest place to find them is under any roofing felt of course and that's one of their favourite spots. Basically they come out at night, jump onto your Chickens and take blood from them, the process taking about two hours. Red Mites do not fly. Infestation and non-treatment can lead to your chickens getting very unhealthy and sometimes cause them to die. 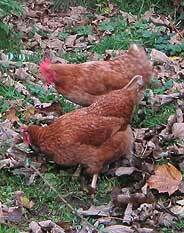 Have my Chickens got Red Mite? There are various signs of you having Red Mite and rest assured, most Chicken Keepers at some stage will experience them. Look very closely at the ends of the Perches and any other crevices around and about. Search for any 'white dust' clumped up or spread out a little. It should be said that Red Mite are only red when they are full, at other times they are a grey / white colour. If you find some of this dust, no matter what colour depending on the time of the day, press your finger on it. If they are Mites, your thumb impression will leave blood and you'll see it on your thumb as well of course. Look for any general lack of condition such as a paler comb, drop in egg production (some eggs may even have the occasional red spot in them) and some lethargic behaviour. 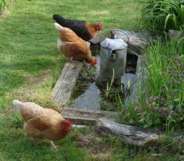 You may start to notice skin irritations caused by the chickens trying to rid themselves of the parasites. During the night wander up to the Chicken Run and listen - if you just hear the usual grunting's and chirps, OK., but if Red Mites are on your Chickens they will be noisier than normal, flap their wings more and you'll hear them scratching. Old fashioned Creosote painted in the Coop. Some say that using double sided sticky tape helps. If you have a Felt Roof, you will have to take it off to treat, this is their favourite spot and leaving it will not solve any problems. 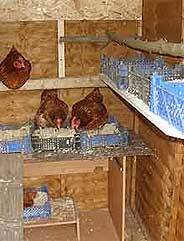 Let your chickens have space wherever possible during the day. Their way of helping themselves is to take dust baths. 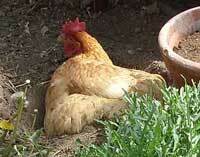 You can sprinkle some Diatomaceous Earth in their favourite spot which will help. Plastic Chicken Coops are without a doubt less prone to getting Red Mite in them. Keeping your Hen House as clean as possible. Check your Coop every day, especially through the warmer month's. Note - Whatever you are treating your Coop with, please ensure you read all the instructions carefully, some remedies may require you re-housing the Chickens for a short time. Again I would emphasize you have not failed should you get an infestation, it can happen no matter how well you care and attend your Chickens. There are many threads in the very active Down the Lane Forum referring to this and if you have any questions, ask away, no question is a silly one!